Apothecary jars were used to store and preserve crude and compounded drugs, in both dry and liquid forms. They were made from a variety of materials including wood, glass, ceramic, and metal. They came in various shapes and sizes: Tall-waisted albarelli and wide-mouth jars were used to store dry, bulky material such as leaves, bark, and flowers. Syrup jars with spouts and handles were used for liquids. Small, thin-necked containers held minute quantities of liquids, and tiny vials and pots were used for dispensing medicines to patients. The ceramic jars in the Bristol-Myers Squibb collection are an eclectic mix from European cities such as Faenza, Florence, Siena, Castel Durante, Urbino, Castelli, Genoa, Savona, Verona, Venice, Milan, Strasbourg, Rouen, Dresden, Berlin, Nuremberg, Offenbach, Flörsheim, Frankfurt, Hanau, Delft, and Catalonia. Apothecary containers generally represented a small portion of a potter’s inventory of tiles and tableware. Drug jars were often a means to supplement a craftsman’s income. There was a steady market for apothecary containers for pharmacies, hospitals, palace apothecaries, and monasteries. Many Italian potters found the home market crowded, and thus they migrated to more lucrative areas across the European continent adding to the difficulty of identifying the provenance of early apothecary containers. Well-to-do pharmacists arranged to have large sets of jars produced with coats of arms or other distinguishing images symbols applied to the jars. For example, the straight-walled container 1991.0664.0715, produced in 1734 for the court pharmacy of Dresden, and bears the initials AR referring to Augustus Rex, King Augustus II (the Strong), of Poland. Flanking the initials are a coat of arms with crossed swords for the Electorate of Saxony, and another coat of arms for the Kingdom of Poland. Albarelli and other ceramic containers were also used in the home to store medicines, spices, and dyes. Containers without lids were covered with parchment or cloth and tied with a string at the neck. Jars with labels referencing their contents begin to appear in the 15th century. Sometimes a blank area was left on the jar in which the apothecary could write the jars contents. The earliest jars in the collection are decorated with geometric patterns and deep blue and yellow hues. Historical and religious themes were popular as decoration in the 17th and 18th centuries. Abbreviations and alchemical symbols seen on many of the collections jars varied from century to century and from country to country. One plant could be spelled or abbreviated several ways, consequently it is not always possible to decipher the labels on drug jars. Physicians and their patients were preoccupied with the digestive system. There was an inordinate number of remedies in the seventeenth and eighteenth century having to do with the control or the lack of control of bowels, flatulence etc. This small earthenware jar was used to contain extracts used in the preparations of medicines. 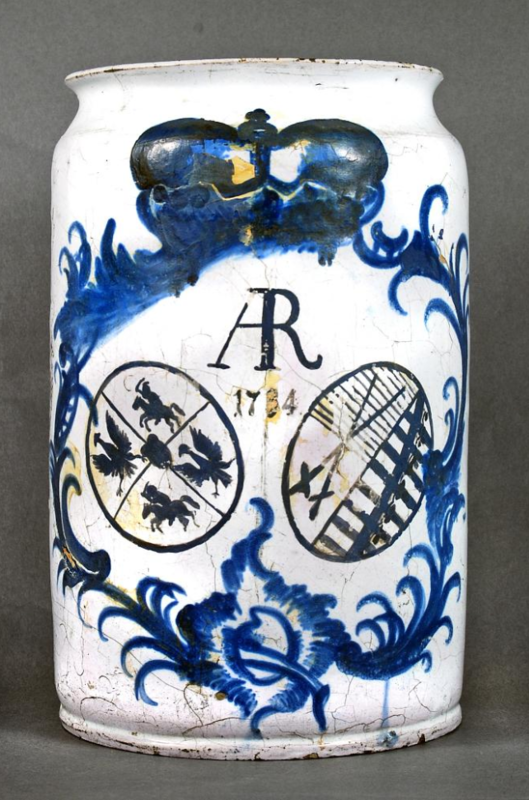 This blue monochrome drug jar has a cobalt blue stylized floral motif and scrolls. There is a cobalt blue and yellow-brown escroll in the center of the container inscribed with gothic script. This white and blue majolica drug jar has a round shield topped by a crown in its center. The maker’s mark is on the bottom of the container and has been attributed to the city of Nuremberg, Germany. This waisted drug jar has a flared foot and a deep blue glaze over a white background. The jar is decorated with stylized flowers and leaves on the upper and lower shoulders. The label at the center of the waist is marked Ung: au Frabirm. The jar would have contained some type of unguentum, or ointment. It belongs to a set of drug containers seen in objects 1991.0664.0589 through 1991.0664.0596. This waisted drug jar has a flared foot with a deep blue glaze over a white background. The jar is decorated with stylized flowers and leaves on the upper and lower shoulders. The label at the center of the waist is marked, Conf Hiacint Co. The jar would have contained Confectio de Hiacintho, or Confection of Hyacinths (Jacinths). The Confection of Hyacinths was an electuary, or paste, made from red zircon that was used as a stomachic to improve appetite and digestion, and an anthelmintic to kill intestinal worms. This jar belongs to a set of drug containers seen in objects 1991.0664.0589 through 1991.0664.0596. This waisted drug jar has a flared foot and a deep blue glaze over a white background. The jar is decorated with stylized flowers and leaves on the upper and lower shoulders. The label at the center of the waist is marked, Cinms Cassia Donz. The jar would have contained the plant Cinnamon cassia, also known as Cinnamomum aromaticum. The plant was often used in alcoholic solutions as a mild tonic. This jar belongs to a set of drug containers seen in objects 1991.0664.0589 through 1991.0664.0596. This waisted drug jar has a flared foot and a deep blue glaze over a white background. The jar is decorated with stylized flowers and leaves on the upper and lower shoulders. The label at the center of the waist is marked, Ung d althea. The jar would have contained an ointment made from the Althaea, or marshmallow plant. The ointment was often taken from the roots of the plant and used as an emollient and demulcent (an oily substance to relieve a sore mucous membrane). This jar belongs to a set of drug containers seen in objects 1991.0664.0589 through 1991.0664.0596. This straight walled drug container has a flared lip and base. The jar has a white tin glazed background and is decorated with a blue crown flanked by blue vines, leaves, and flowers. A maker’s mark is on the bottom of the container. George Urdang attributes the jar to 18th-century Rheinisberg, a small town near Berlin. The crown is the royal Prussian crown.